When we were in Alaska I volunteered with the Cub Scouts; I spent my time as the Bear leader, then moved up to Webelos with Max when he aged up. While wrangling adolescent boys was not my most favorite thing ever, I had the pleasure of organizing our Blue and Gold banquet last winter and I was in heaven! 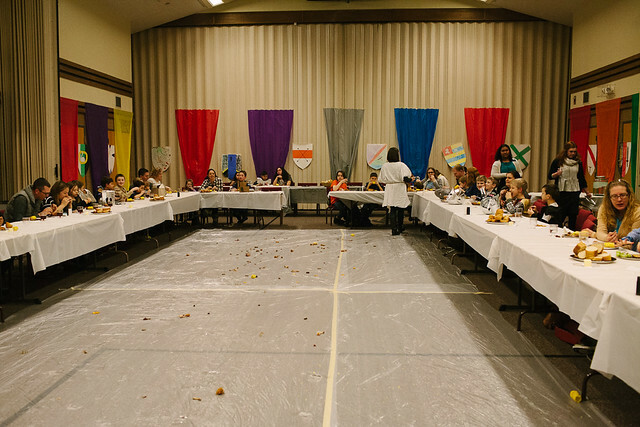 I pretty much coerced everyone into a Knights of the Round Table theme because the possibilities are endless; it turned out fantastic (I may have gone a little overboard though...) and everyone had a great time. I've had lots of questions about it so here's a summary of everything so you can recreate it with your own pack. Unfortunately, I didn't take as many photos as I would have liked since I was the one running things. So, I apologize for the lack of detail shots but hope you're able to get a good idea of things anyway. To prepare for this I recalled all the details I could from my visits to Renaissance Fairs and Medieval Times growing up, and watched A Knight's Tale several times (with specific scenes over and over) until I got all the details out of it I needed (like phrasing and certain props, etc.). 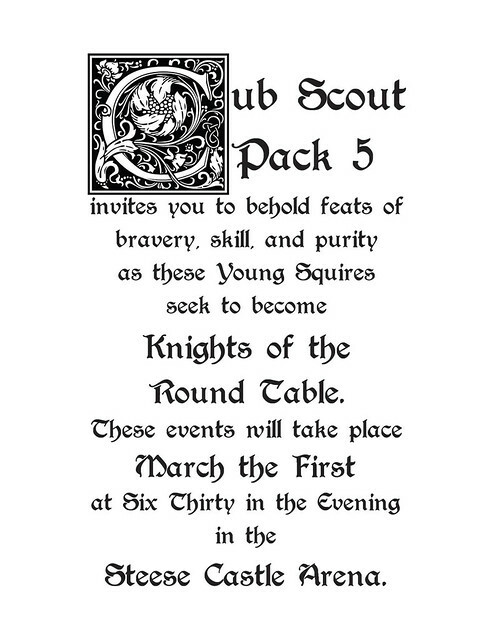 And the basic idea of the night (and things like the food and sword in the stone) came from my friend's mom who was (and is) an incredible Cub Scout leader when I was a kid; thanks Sister Wassink! 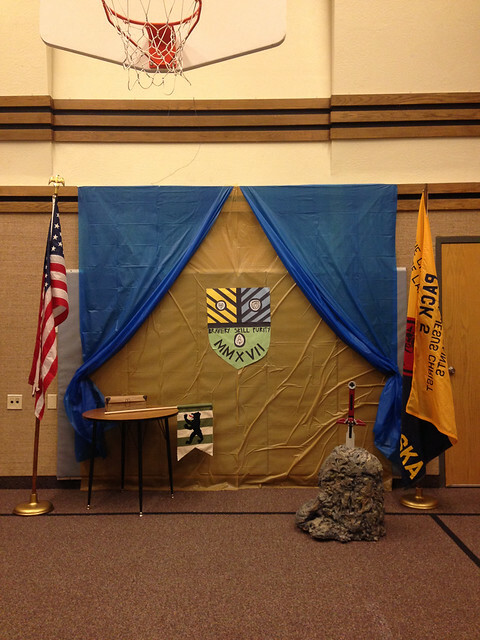 The front of the room had the flags, a chest that held the scouting awards, and the sword in the stone. The smaller flag on the table was the one we used to mark the start of each joust. 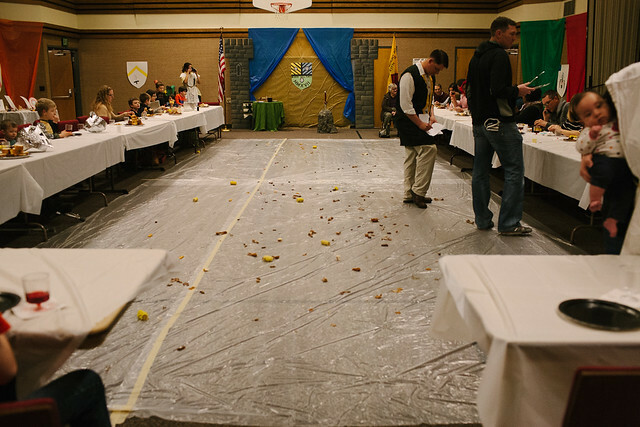 The theme of the night (aside from Knights of the Round Table) was Bravery, Skill, and Purity. 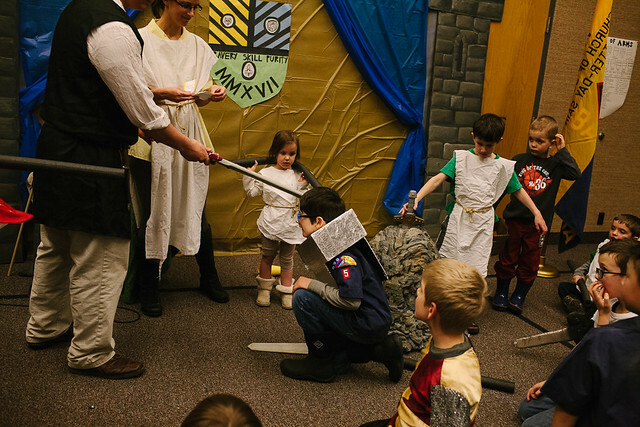 The night revolved around those three tasks: the Joust to prove Bravery, their Scout awards to prove Skill, and Pulling the Sword from the Stone to prove their Purity. Each Scout made (at home) armor to wear over their uniforms. They also came up with a "Knight name" to go by for the program. Things like "Nick the Brave" and "Max the Magnificent." I used simple, cheap plastic tablecloths as hanging tapestries. They made a huge impact for not very much money in transforming the gym into a banquet hall. I had the tables set up (the missionaries came and helped me put it all together) in a big U with all the chairs on the outside (we had some extra tables so there ended up being a row of extra seating behind the U too). Each table had simple white plastic tablecloths and I "set the table" beforehand. We used black and silver paper plates from Wal-Mart and Dollar Tree (I alternated the black and silver on the table) and I found these goblets from Dollar Tree, which I was over the moon about because they were perfect for the atmosphere (as opposed to normal plastic cups). There were no utensils; they didn't use them in medieval times so we didn't either. The floor in the middle of the U had plastic tarps we taped to the ground. The night started off with the Feast: we ate all finger foods. We had fried chicken, bread, and had the families bring a side like grapes, potato wedges, one family brought boiled peanuts, and various other finger foods. When they were done with their bones, or shells, or grape stems they would throw them onto the tarp. 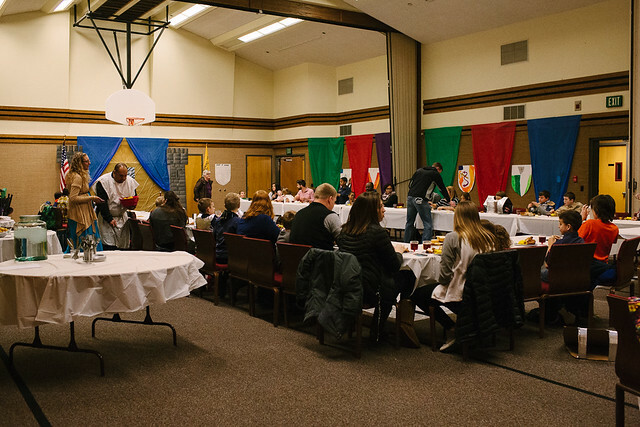 Typically for these types of events things are done buffet style, but to keep the atmosphere in character the leaders were serving wenches and swains. They carried the food out on platters and would dish it out for everyone, or brought out the pitchers of water or juice and filled glasses. Once everyone was done eating we pulled the tarps up with all the trash contained inside: easy-peasy! Then I set up the divider for the joust; I used white bunting I had made for my sister's wedding strung between cardboard supports. 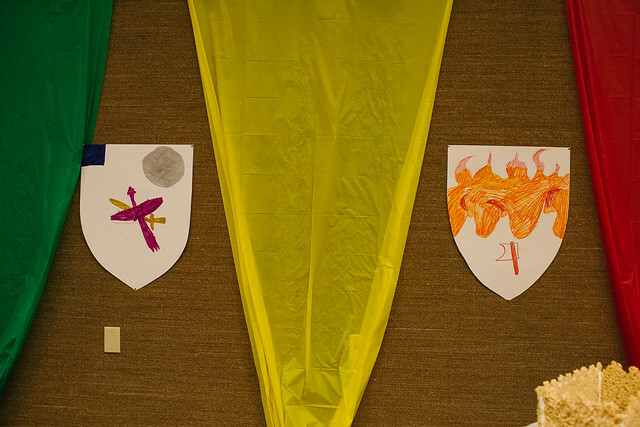 We did do some things in the weeks leading up to the event to prepare; one of them being the coat of arms. 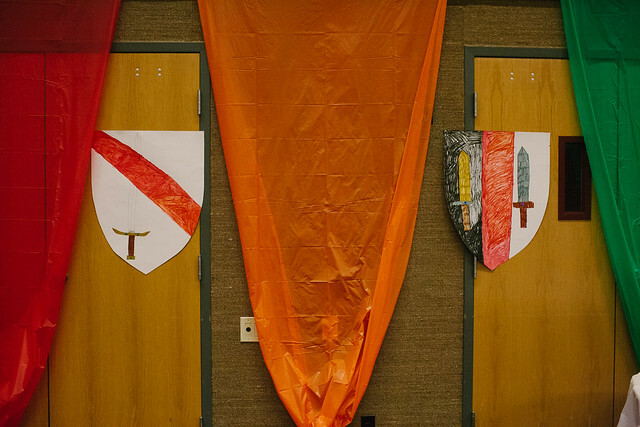 I got normal white poster board and cut each into a shield shape, then each scout got to make his own coat of arms. I used this website to find the meaning behind colors, patterns, and objects and listed it all on the chalkboard for them. Then they chose what they wanted and went to town! I had markers, crayons, and construction paper for them to use. It ended up being the perfect amount of shields so that I could alternate the banners and coat of arms. I had so much making the decorations and stuff for this. 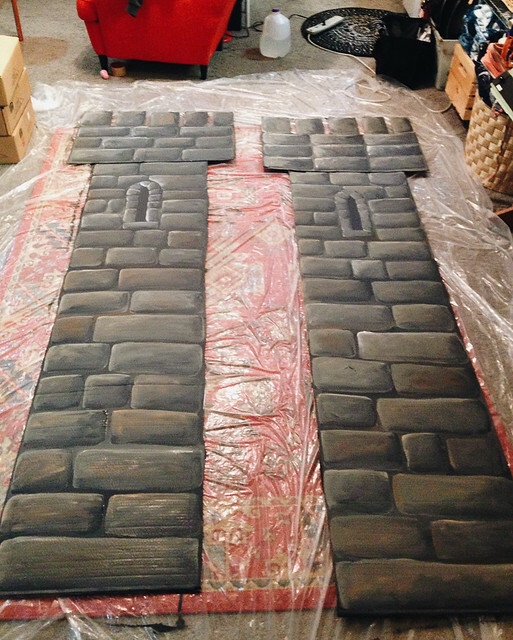 For the two towers I used cardboard and painted it, then just leaned it against the wall. The stone was a little trickier so I used Rob's help with the mechanics. We already had the big Nerf sword, then he found a cardboard tube it would fit into. He stuffed the tube with a bunch of random stuff like more cardboard, fabric, and filter material to make it difficult to get the sword out. Then we put the tube inside a cardboard box, then covered that with insulating expanding foam. 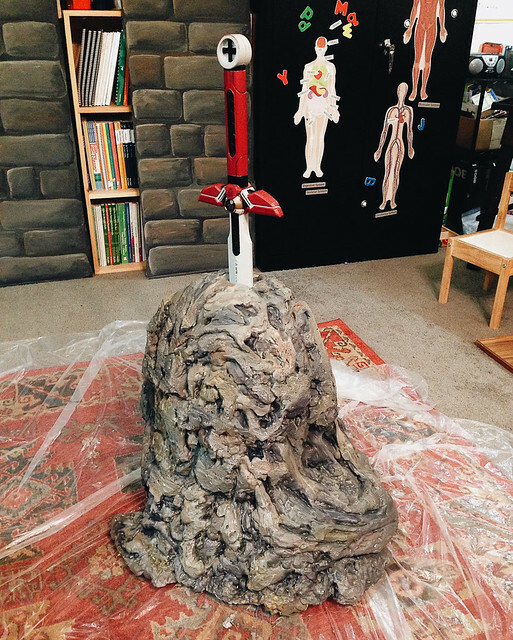 Once the foam was dry we carved it to make it look stone-ish, then I painted it. It ended up looking a little more like volcanic rock than we intended, but it was still pretty awesome. 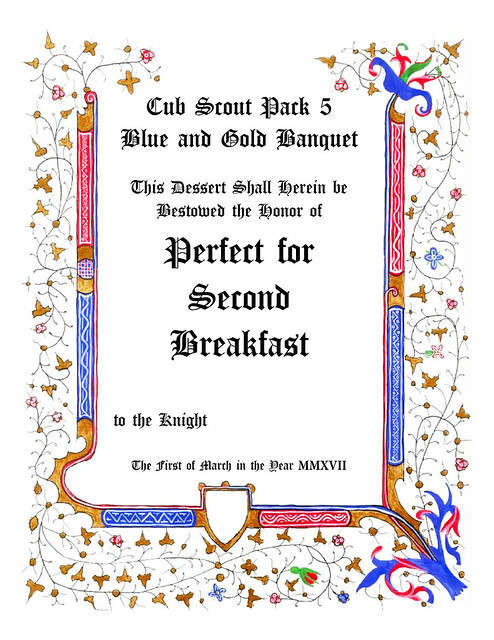 One of the traditions for our pack's Blue and Gold Banquets is to have the boys make and bring a dessert, then each dessert gets a fun award. I had fun thinking up medieval-ish awards (those are included at the end too). We always make more than there are boys so there are a variety to choose from; I ended up with 34. 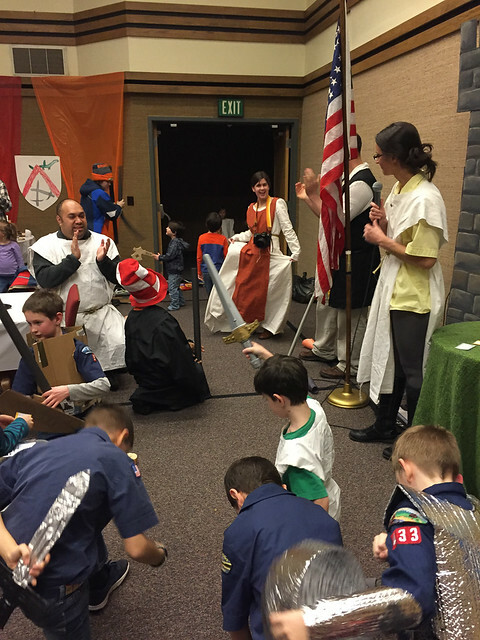 I am all about dressing up, so I had all the leaders wear a white shift with a rope belt to stay with the serf theme. 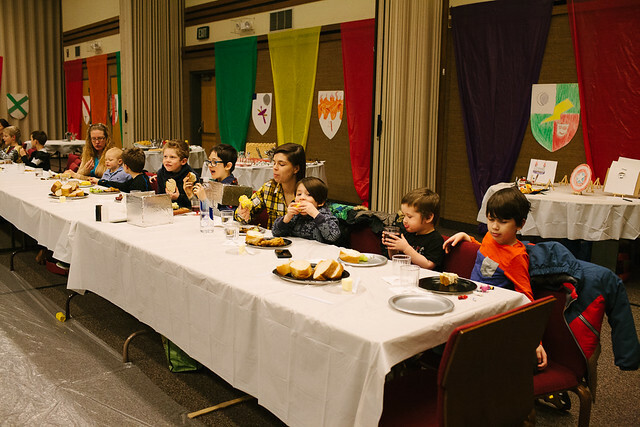 All the boys sat with their families and we started the night off with the flag ceremony, immediately followed by the Feast. While we ate I had medieval music playing to help with the ambiance. If we had had the budget I would have loved to get the flickering LED candles to use instead of the overhead lights. We had all the scouts go out to the hallway to get lined up, then we had the Procession of Champions to start things off. We had the boys line up youngest to oldest, then they were announced (using their Knight name) one by one. As a fanfare played, each boy walked along the inside of the U of tables (they were all a few paces behind the person before them) so everyone could admire them, then they lined up at the front of the room once their pass was complete. Once everyone had been announced and finished their promenade the joust began! Each boy retrieved his jousting stick and his stick horse (I already had those); to prevent injury we used precut pipe insulation that the boys made a handle for with construction paper (we cut them into semi-circles then wrapped them around the tube). They made their jousting sticks and we rehearsed the joust at a previous scout night. We had a list of everyone already teamed up and when each pair was announced they moved to opposite ends of the divider (on opposite sides) and waited for the signal. Our announcer (one of the leaders who got really into it; he was awesome) would tell them "Stand Ye Ready!" while the flag person took their place in the middle. Then when the flag was raised, they went at it! We didn't do a bracket or anything to determine a "winner." We just had each boy take a turn and then they were done. I also had music playing during the joust, this time from the A Knight's Tale score. Once everyone had finished their joust it was time to pull the Sword from the Stone! Each boy was called in order from youngest to oldest and got to pull it out (it wasn't easy either). After that, each boy received his scout awards and was then Knighted. Then it was time for dessert! 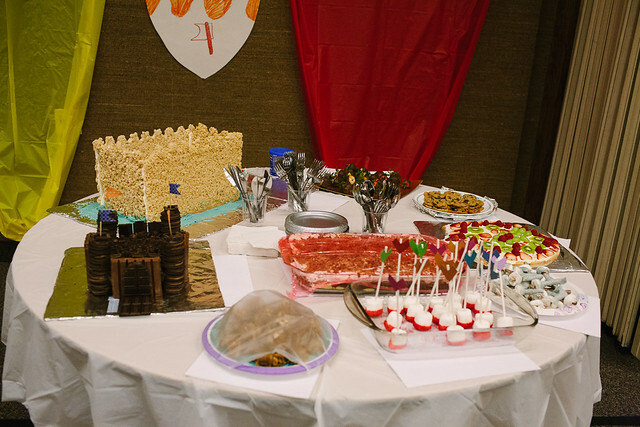 During the joust a couple of the leaders chose the awards for each dessert, and while everyone was eating those were announced. And a sidenote: while we didn't use utensils during the feast we did have them for dessert. I had some of the fancy real-looking silver ones left over from a different event I had thrown so we used those since they were perfect for the theme. And that was it! I'm a crazy overachiever so I made myself a dress to wear; a friend snapped this of me at the end of the night. Here is a link to the invitation, dessert awards (there is an individual PDF for each one, then a condensed PDF at the end that contains all of them in one document), and the outline/write-up/script of the whole night. It was such a fun night, the scouts LOVED it, and I hope yours is just as fun! This is so awesome! What a wonderful banquet. Wow. That is amazing! You are so awesome you put the rest of us to shame!